Wirecast live production and streaming software is ideal for use in schools, colleges and university. Watch this series of videos to find out how you can launch new streaming services for lecture capture, event coverage and graduation ceremonies, plus create unique teaching resources. 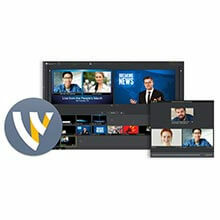 Holdan is the exclusive European distributor for Wirecast, ScreenFlow and Telestream's desktop products. To find out more, please call us today on 01457 851000.